The following newspaper clipping is copied from the Seattle Post-intelligencer, December 4, 1899. Accused of Shooting at an Enemy on the Public Street. 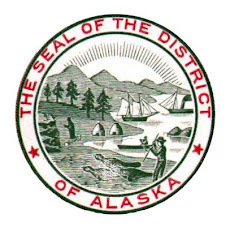 Bascom Smith, a brother of “Soapy” Smith, the former Skagway bandit, is in the city jail on the charge of shooting at a man named Sam Allen, who stays at the Northern hotel. The alleged shooting took place early Sunday morning on First Avenue, south. No one seems to know the cause of the trouble between the two men, though it was stated yesterday that the feud between them originated at Skagway some months ago. 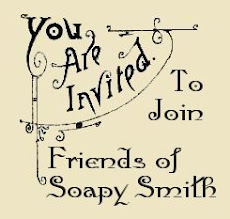 Smith is said by the police to be an opium fiend, and an opium pipe was found in his possession at the time of his arrest. He has served a term for vagrancy. Early family records show that the spelling is "Bascomb," though it is often spelled "Bascom." The shooting took place on Sunday morning December 3, 1899 on First Avenue, which passes by the Horseshoe Saloon and the Great Northern Hotel, likely "the Northern hotel" where Sam Allen was staying. Both buildings still stand, in what is known as Pioneer Square today. The article implies that the trouble between Smith and Allen started in Skagway, Alaska. This is interesting as it is one of a very few indication that Bascomb may have traveled to Skagway to work with his older brother, "Soapy. 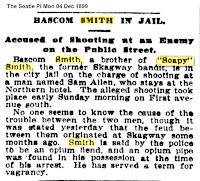 Previously, there were newspaper articles that hinted that Bascomb was an "opium fiend" and this clipping states that the police confiscated an opium pipe in his possession when arrested. I think it can be said with enough certainty that Bascomb did indeed smoke opium. The article states that Bascomb had "served a term for vagrancy." 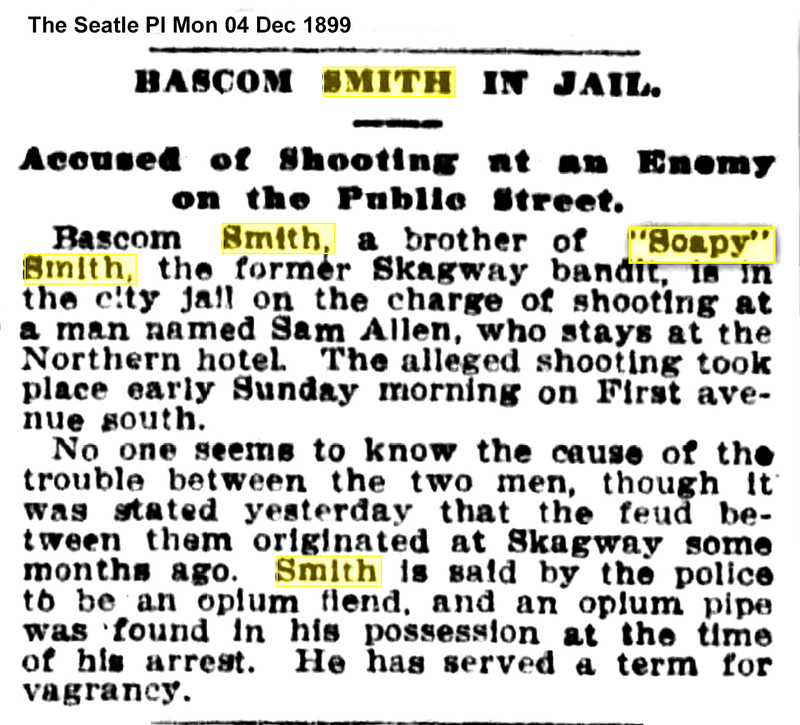 On October 25, 1899 Bascomb was arrested for vagrancy (see Seattle Daily Times news clipping below). This is approximately 39 days previous to the attempted shooting of Sam Allen. I do not know the average sentencing "term" for vagrancy in 1899, but can guess that it would not be more than the 40 days difference between the arrest for vagrancy and the shooting incident. Three days after the attempted shooting of Sam Allen, Bascomb was brought before the municipal court, "with a number of minor crimes." Instead of being sentenced to prison he was given twenty-four hours to leave Seattle (see Seattle Daily Times news clipping below). 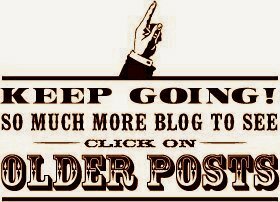 There are no more newspaper accounts of Bascomb being in Seattle. It is believed that Bascomb obeyed the court order to leave the city. Bascomb disappeared from record. Did he leave Seattle? When did he die? Did he die unidentified? One day I hope to find out. Bascomb Smith: pages 22, 41-42, 67, 75-76, 88-89, 92, 120-22, 139, 143, 162-63, 165, 167, 169, 176, 178, 182, 214, 247, 264, 273-75, 336, 340, 352, 355, 361, 363, 367, 370-77, 381-86, 391-99, 403-05, 408-09, 412, 420-23, 519, 554-55, 584, 588-89, 594. "The confidence man carefully evaluates every stroller or idler, whom he divides into two classes. First is the man whose loyal face or upright posture reveals a puritanical temperament disdaining involvement in any con game whatsoever. 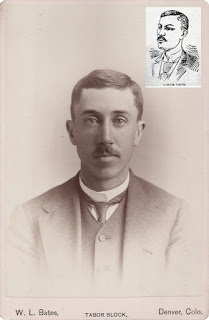 Second is the man, perhaps a farmer or industrial worker, who appears sophisticated enough to recognize an ordinary swindle yet ignorant enough to be fooled by a subtler, more involved swindle, a man whose face and air reveal a certain weakness of temperament, a certain latent unscrupulousness which the pitchman detects on sight." —Eugene Villiod, Crooks, Con Men and Cheats, 1905. 1792: The Humane Society of Massachusetts is incorporated. 1813: The first raw cotton-to-cloth mill is founded in Waltham, Massachusetts. 1821: The Philadelphia College of Apothecaries establishes the first pharmacy college. 1822: The city of Boston, Massachusetts is incorporated. 1836: The siege of the Alamo begins during the Texas Revolution, in San Antonio, Texas. 1839: The first express service in the U.S. is organized between Boston, Massachusetts and New York City by William F. Harnden. 1847: Mexican General Santa Anna is defeated at the Battle of Buena Vista in Mexico by U.S. troops under General Zachary Taylor. 1858: The U.S. Senate approves statehood for Kansas. 1861: President Lincoln secretly enters Washington D.C. to take his office after an assassination attempt in Baltimore, Maryland. 1861: Texas is the 7th state to secede from the Union previous to the Civil War. 1870: The state of Mississippi is readmitted to the Union after the Civil War. 1874: Walter Winfield patents a game called sphairistike, later known as lawn tennis. 1875: J. Palisa discovers asteroid #143 (named “Adria”). 1877: Mormon Elder John Lee is executed by firing squad for his planning of masterminding the Utah Territory Mountain Meadow Massacre in 1857, which resulted in the murder of a 120 Arkansas emigrants bound for California. The Mormons persuaded the emigrants that they could freely pass unharmed if they surrendered their arms. Indians, hired by the Mormons, murdered all but 18 children. 1883: Two people are killed by Indians at Point of the Mountain, Arizona Territory. 1883: Alabama is the first state to enact an antitrust law. 1886: Charles Hall completes his invention of aluminum. 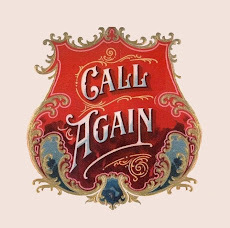 1889: President Harrison opens Oklahoma for colonization. 1896: The Tootsie Roll is introduced by Leo Hirshfield. 1904: The U.S. acquires control of the Panama Canal for $10,000,000. 1905: The Rotary Club is founded in Chicago, Illinois. 1910: The first radio contest is held in Philadelphia, Pennsylvania.